Between Parent and Child (2003) by Dr. Haim G. Ginott, Dr. Alice Ginott, and Dr. H. Wallace Goddard is an update of the 1965 parenting classic. The book covers situations starting from toddler tantrums to talking to teens about the facts of life, and it manages to do so without seeming scattered or too sparse. A- definitely can’t hear me when she’s in the grip of strong feelings, so it makes sense to me to focus on reassurance. Sometimes when she’s really upset, she shows me that she wants some space by running away and crying, “Not Mama!” That’s cool. I say, “Okay, I’ll be right over there. Let me know if you want a hug.” Sometimes she wants to be close (“Up! I want to be in the carrier!”) and that’s cool too, although it’s a bit harder when I don’t have the carrier handy. I like the point that the book made about helping kids learn how to appreciate music and use music as an outlet for feelings, since I tend to think of it in terms of cognitive benefits instead of appreciating it as a human art. A- and I have been going to music class since she was a year old, although I think that’s been mostly because I like singing nursery songs and enjoy learning more of them. As she grows, I want to model enjoying music around her, and maybe help her find something she likes to do too. We’ve got a piano, a toy glockenspiel, and a couple of ukuleles and recorders, so there’s plenty to explore. Also, A- loves dancing, so I should remember to put music on more often. It might be interesting to experiment with the “Show me how angry you are” approach the next time A- gets angry. I wonder if she’ll take me up on drawing or dancing it out. The parent-as-consultant approach for homework help and everyday living sounds really nice–almost too idealistic, but who knows? Anyway, it might be worth trying as A- gets older. Overall, Between Parent and Child is probably the book I’d recommend as a practical overview of this parenting approach, using other books such as How to Talk so Little Kids Listen and No-Drama Discipline for deeper dives. If you like this sketchnote, feel free to print, reuse, or share it under the Creative Commons Attribution Licence. Enjoy! Tech note: I drew this sketchnote on my phone (Medibang Paint on a Samsung Note 8), so the handwriting’s a little shakier. It was great being able to read and sketch in little snippets of time. 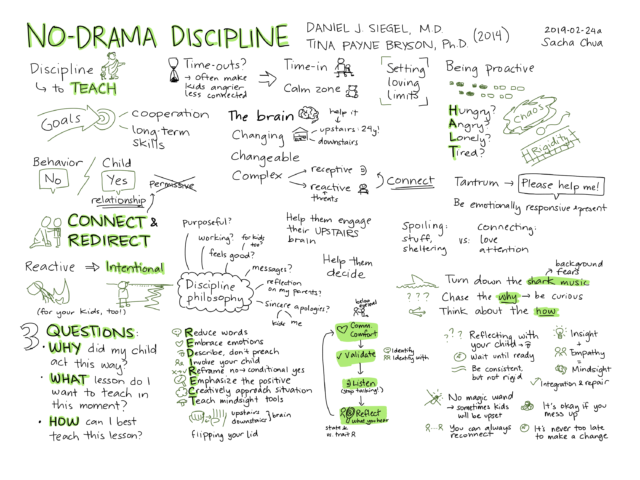 No-Drama Discipline (2014) was written by Daniel J. Siegel and Tina Payne Bryson. The book takes a connection- and skill-building approach to parenting kids, especially during difficult moments like tantrums and misbehaviour. I like how it encourages me to take a step back and think about the long-term skills I’d like to help A- develop, and it has lots of examples of redirection and teaching. I’m still firm when it comes to safety or other people, and sometimes I’m not in the right space to be patient. I’ve been focusing on accepting, validating, and describing A-‘s emotions whenever I can. It’s getting easier to say, “I see you’re upset. I’m here if you want a hug.” It’s hard to see what kind of progress A- might be making on her side, and I still worry from time to time that I might end up being too permissive, or that she might depend on me too much for emotional regulation. But kids have turned out just fine with a wide variety of parenting approaches, so things will probably work out too. I wonder if A- will grow into the sort of kid who resonates with the kinds of conversations described in the book. If she isn’t, that’s cool, we’ll adapt. In the meantime, this approach resonates with me, and I like what it’s helping me learn. Although the book felt repetitive at times, I found it helpful to see the principles applied in lots of different scenarios. I also liked reading a few stories about when it just didn’t work out, which made the approach feel more human and relatable. It might be useful to read this book backwards, actually: start with the refrigerator-sheet summary near the end of the book, and then fit the other chapters into that framework. How does the book fit in with the other books I’ve been reading along these lines? No-Drama Discipline focuses on connecting and calming down kids (and quieting our internal anxieties, or “shark music”), while How to Talk so Little Kids Will Listen goes into more detail on collaborative problem-solving. 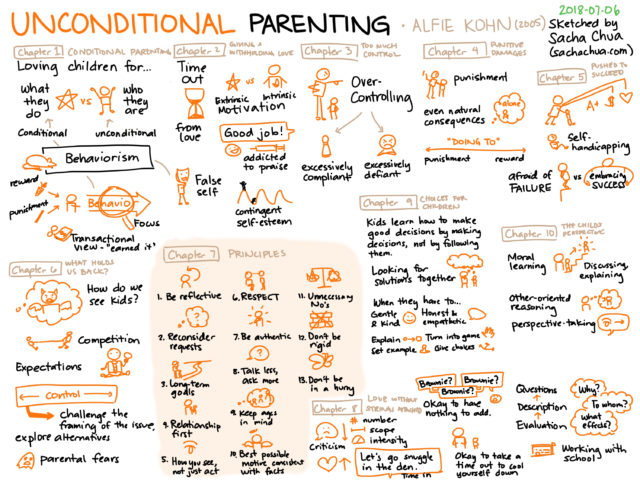 I think No-Drama Discipline gives more concrete advice than Unconditional Parenting does, but covers a narrower range of topics than Between Parent and Child. Positive Parenting by Rebecca Eanes is a bit more of an overview, while No-Drama Discipline is more of an in-depth look at one topic. Updated 2018-07-29: Added note about doing to / working with. Anyway. On with the book notes. 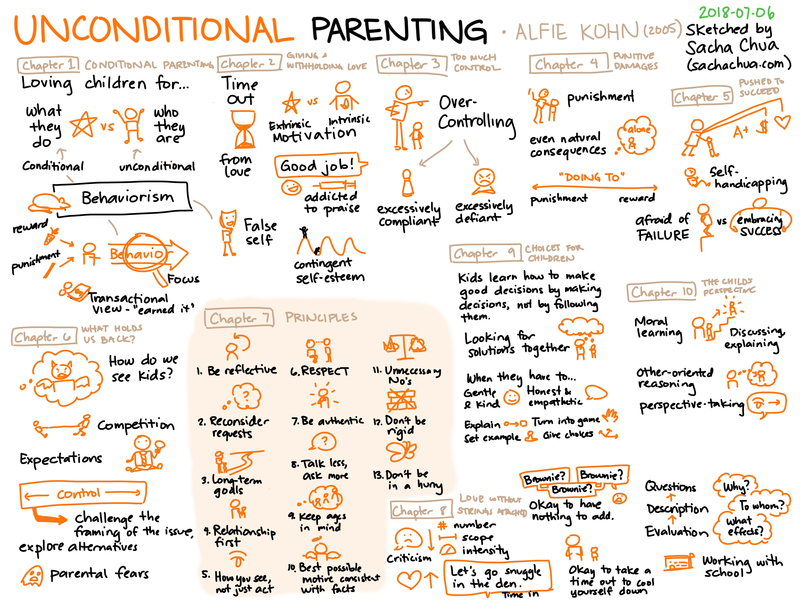 Unconditional Parenting (Atria Books, 2005) resonates a lot with the kind of parenting we seem to be doing, and it challenges me to go even further. I’m looking for alternatives to timeouts and reward charts mostly out of curiosity, not because I judge people who use them or that I’d judge myself if those techniques end up being what we feel we need. It’s good to explore possibilities and learn from experiences. I have so much fun observing A- and acknowledging all the cool things she’s doing. I need to be careful not to crowd her, though, or to make her feel that she’s only interesting when she’s doing new things. She’s good at telling me when she wants me to do something different (“Mama dance different dance!”) or when she wants me to do the same thing she’s doing. (“Play playdough together!”) I’ve been working on toning down the running commentary for words she already knows, giving her more quiet time, and waiting until she prompts me by looking at me or talking to me. It can be hard to sit there, though. I also catch myself thinking in terms of positive reinforcement of behaviour, so that’s something to watch out for. So far, we have the flexibility to invite A- to make lots of decisions with us and to accommodate many of her preferences. For example, she’s not keen on babysitters at the moment, and that’s okay with me. She’s getting better at telling me how she feels and what she wants, and she’s even starting to propose ways to solve problems. For my part, I’m getting better at turning things into games, which has been handy for brushing her teeth. I like focusing on A-, not just on what she says or does. Today, for example, she was suddenly a teenager: “I hate this fish. I hate beansprouts. I hate everything.” Instead of telling her not to use the word “hate,” getting offended, or getting frustrated, I tried different things and found out that she actually wanted her own portion of fish from the fridge, not off my plate. She’s experimenting with big emotions, boundaries, language, and will, and I’m glad I have the space to support her through that. The book has a few details on helping kids develop perspective-taking skills, which was one of the skills in the ELECT framework that I wanted to focus on. I’m looking forward to modeling perspective-taking through conversation, and practising taking her perspective too. I like how it can turn even unpleasant encounters into opportunities for reflection, which reminds me a lot of Stoic philosophy. Unconditional Parenting is quite different from most of the parenting books I’ve come across, and it probably isn’t a good fit for everyone. It’s a little heavy on the negative side, and would probably get lots of people’s hackles up. I would have liked to read more about the challenges of applying the approach and how to figure things out together. That’s often the challenge with parenting books – the anecdotes sound so smooth, but I’m more curious about the figuring-out parts and the repairs and the let’s-try-agains. I guess I’m looking for something less sales-y, more open source support forum-y, if they makes sense? Anyway, I think we have a good opportunity to try out a few of the ideas from it, though, so it might be fun to explore while we can. It’s been a while since it was published, so I wonder what more recent recommendations say. I do like the book’s distinction between “doing to” parenting and “working with” parenting. It reminds me of the way pedagogical documentation reframes the grown-up’s role from the dispenser of wisdom to a co-learner supporting the kid’s growth. The book reminds me of Raising Our Children, Raising Ourselves and How to Talk So Little Kids Will Listen, both of which feel like books I can recommend a bit more generally. Janet Lansbury’s stuff, too. As always, it’s all a grand experiment, so if something different works for your family, great, good for you! Goodness knows different things work for us at different times, too. It’s good to have things to think about and try out, though! I read Kristin Neff’s Self-compassion: Stop Beating Yourself Up and Leave Insecurity Behind (2011) on the recommendation of a friend who’s been working through many of the issues addressed by the book. I liked the book’s differentiation between self-esteem and self-compassion, and its exercises for acknowledging your inner critic and becoming kinder to yourself. The website (self-compassion.org) has MP3s for guided meditations and a hyperlinked bibliography of related research. 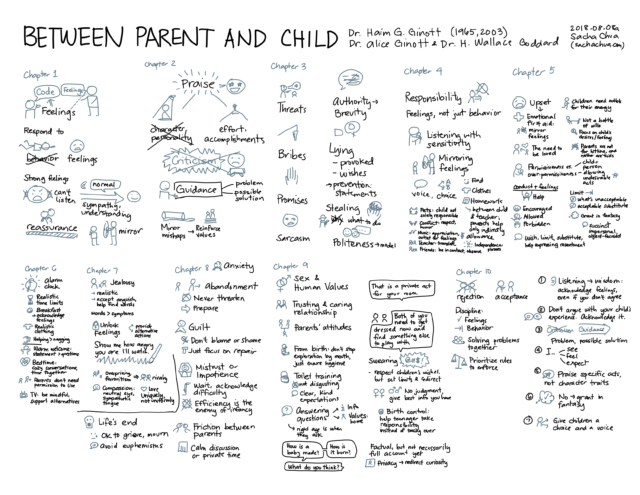 I’ve sketched the key points of the book below to make it easier to remember and share. Click on the image for a larger version that you can print if you want. 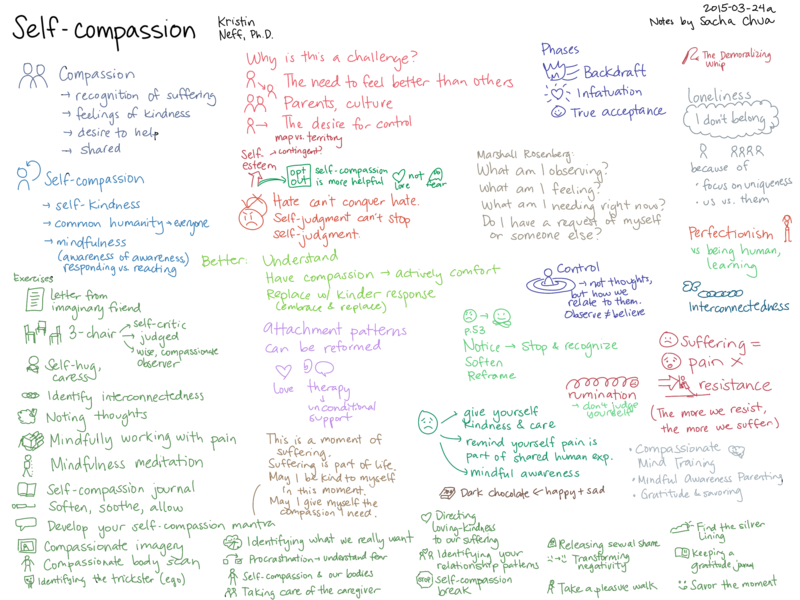 I’ve been thinking about self-compassion and self-care over the past few years, ever since I decided not to set up that taskmaster dynamic with myself. Instead of trying to force myself down one path or another, I chose to go along with myself, focusing on understanding and then slowly guiding myself. It seems to be working well. I can tell the difference between that and the approach many people seem to take (decision, guilt, shame, force), and I like the kind approach more. It’s good to be able to look at your negative internal monologue or the parts of yourself that you’ve been avoiding thinking about, become aware of what’s going on, and work on reframing or transforming those thoughts. It’s good to look at what you’re resisting and figure out how you can embrace and move through that pain. I’ve had a very easy life so far, compared to other people I know. I’m glad this book exists; the techniques will help me through the challenges that are sure to be ahead, and I hope they’ll help other people too. Good book if you often beat yourself up, judge yourself harshly, or feel lost and frustrated. Haven’t read the book yet? You can buy it from Amazon (affiliate link) or get it from your favourite book sources. Like this sketch? Check out sketchedbooks.com for more. Feel free to share – it’s under the Creative Commons Attribution License, like the rest of my blog. The book that got me into Stoic thinking was William Irvine’s A Guide to the Good Life: The Ancient Art of Stoic Joy (2009). Stoicism resonated with me: the reminder that my perception of things is separate from what those things are; the acceptance that I can control only how I respond to life, not what happens; the awareness of mortality that belies the insignificance of our drama and sharpens the appreciation of our short lives. When I went through popular translations of the source books like the Meditations of Marcus Aurelius and Epictetus’ Discourses and the Enchiridion, I found them easy to read, with a wealth of ideas to apply to my life. Since then, I’ve been on the lookout for more applications of Stoicism to everyday life. 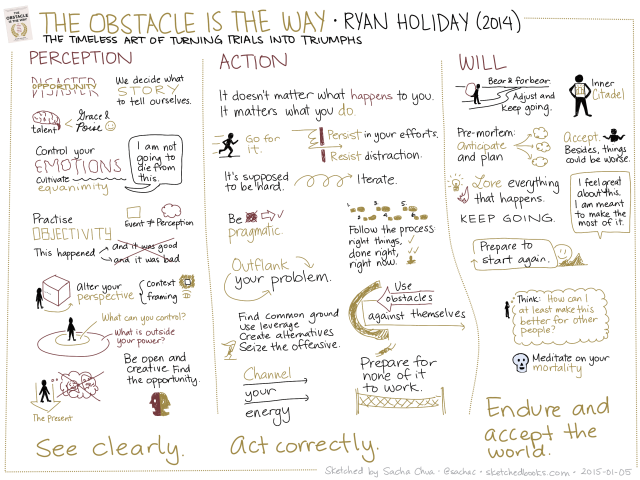 Naturally, Ryan Holiday’s The Obstacle Is The Way: The Timeless Art of Turning Trials into Triumph (2014) crossed my radar. The book expands on the idea that you can view obstacles as opportunities, taking advantage of them in order to grow. Almost all of the thirty-two chapters (covering aspects of perception, action, and will) are illustrated with an anecdote or two, followed by some questions and advice. I came across a number of anecdotes I hadn’t read before, and I liked reading stories of more modern figures instead of just the usual old chestnuts. I didn’t find any new ideas that made me stop and think; if you’re familiar with the key works in Stoic philosophy, you probably won’t get as much out of this book as someone who is completely new. It feels oddly like the book is about this relentless drive towards a goal, but that doesn’t quite fit with what I understand about Stoic philosophy or what makes sense to me. Maybe I’m misreading the book. To me, the freedom described by Stoicism isn’t about achieving great victories after much perseverance and resourcefulness. It’s about realizing that things are what they are, you can choose how to respond to them, and thus you always have opportunities to become a better person as you learn to work with nature instead of against it–even if the path you end up taking doesn’t look like what you imagined. To act with “a reverse clause,” so there is always a way out or another route to get to where you need to go. The wise man never changes his plans while the conditions under which he formed them remain the same; therefore, he never feels regret, because at the time nothing better than what he did could have been done, nor could any better decision have been arrived at than that which was made; yet he begins everything with the saving clause, “If nothing shall occur to the contrary.” … Without committing himself, he awaits the doubtful and capricious issue of events, and weighs certainty of purpose against uncertainty of result. I understand this to mean that Stoics make well-considered decisions that anticipate opposition, but also remember that achieving goals is beyond their control. It isn’t about getting to where you need to go. It’s about being a tranquil person throughout the journey, free from being too attached to the wrong things – including fortune or misfortune. Maybe this isn’t a book grounded in Stoic philosophy as much as it’s a motivational book that springboards from a few Stoic quotes and concepts. This is okay too. It helps me understand what I agree with and disagree with in the book, like the way I agree with and disagree with parts of Stoic philosophy. In terms of presentation, the book’s density of stories appeals to some people and not to others. I’ve become less fond of books packed with short anecdotes. An overdose of the modern approach of aesops every other page, the shallowness and patness of the tales? In a book about obstacles, it would have been nice to see deeper struggles, maybe even with normal folks instead of famous ones; stories of frustration and suspense and everyday things that people can relate to. I’ve long internalized the mental shift suggested by this book–of transforming obstacles and frustrations into things that can help you–but if I hadn’t, would this book help me flip that mindset? Would reading it help someone who’s struggling with perspective – would it add much more value compared to giving them a brief summary of the book? I’m not sure. If reading about other people who had it worse than you and who still achieved greater things is the sort of information you need to pick yourself up and get going, this might be a good book for you. But I doubt that’s the case for many people who feel stuck. We’ve heard the story that the Chinese word for crisis contains the characters for danger and for opportunity (wrong, apparently). Corporate language guidelines might suggest replacing “problem” with “challenge.” Coaches exhort people to reframe their difficulties positively, listing aspects to be grateful about. When I run into my own challenges, it’s not because I’m waiting for the perfect story or maxim to break me out. I get stuck when I don’t take a step back and really see what’s going on instead of what I think is going on. I get stuck when I don’t have a handle on the problem, when I can’t grasp it, when I can’t break it down. I get stuck when I accept the current framing instead of coming up with creative solutions. I get stuck when I’m stubborn and not listening to what the world tells me. These are all points somewhat addressed by the book, but it seemed to lack something. Perhaps I need to read it more slowly, dipping in and out of it for reflections. Although if I’m going to do that, maybe I should sit with the classics instead. Anyway, if you’re curious about the book, you can buy it from Amazon (affiliate link) or get it from your favourite book sources. 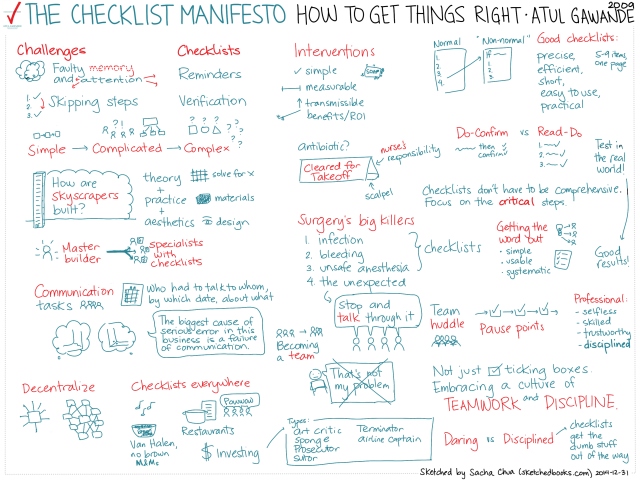 Atul Gawande’s The Checklist Manifesto: How to Get Things Right (2009) emphasizes the power of checklists for improving reliability. Errors creep in when we forget things entirely or skip over things we should have done. In medicine, these errors can be fatal. 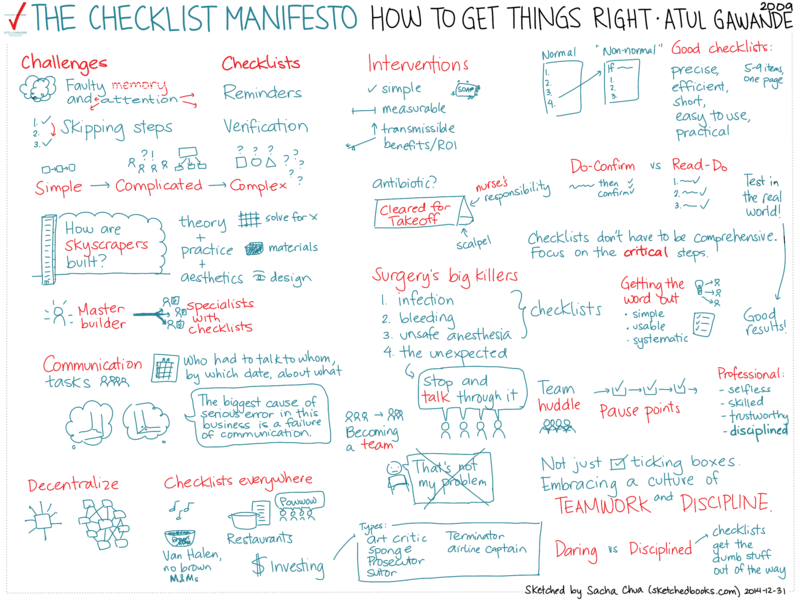 Gawande draws on his experience as a surgeon, the research he conducted with the World Health Organization, and insights from construction, finance, and other industries that take advantage of checklists to improve processes. The book discusses ways to address the cultural resistance you might encounter when introducing a checklist. It recommends making sure that checklists are precise, efficient, short, easy to use, and practical. You need to develop a culture of teamwork where people feel that they can speak up as part of a team. You may even need to modify supporting systems to make the checklist doable. I like the reminders that you should design your checklists around logical “pause points,” keep checklists focused on the essentials, and treat people as smart instead of making the checklist too rigid. The book distinguishes between “Do-Confirm” checklists, which allow experienced people to work quickly and flexibly with a confirmation step that catches errors, and “Read-Do” checklists, which walk people step-by-step through what they need to do. I’m looking forward to applying the book’s tips towards systematizing my sharing. For example, I’m working on a YASnippets in Emacs that will not only display a “Read-Do” checklist for doing these sketched notes, but will also assemble the links and code to do the steps easily. Sure, no one will die if I miss a step, but I think discipline and thoroughness might yield dividends. I also want to develop a good “Do-Confirm” process for writing and committing code; that could probably save me from quite a few embarrassing mistakes. … By the end, 80 percent reported that the checklist was easy to use, did not take a long time to complete, and had improved the safety of care. And 78 percent actually observed the checklist to have prevented an error in the operating room. Nonetheless, some skepticism persisted. After all, 20 percent did not find it easy to use, thought it took too long, and felt it had not improved the safety of care. A full 93 percent said yes. The following quote sums up the essential difference between a checklist for a doctor and a checklist for a pilot. So checklists are a good idea when you’re dealing with people’s lives, but what about the rest of us? Checklists are good for catching errors and building skills. They’re also great for reducing stress and distraction, because you know that the checklist is there to help you think. That’s why packing lists are useful when you travel. Want the book? You can buy it from Amazon (affiliate link). Like this sketch? Check out sketchedbooks.com for more. Feel free to share – it’s under the Creative Commons Attribution License, like the rest of my blog. Enjoy!